During the summer months, Mammoth Mountain operates a bike park full of terrain, trails for levels from beginner to expert and has events for the whole family to watch. You can start your day at the "Adventure Center" which is the main lodge area up HWY 203, which is the road you use to come to town. At the main lodge the chair lifts and gondolas will operate to take riders and watchers all over the hill. The park is generally open from 8:00AM - 6:00 PM. The Adventure Center has fun things for the kids who don't ride to do, such as the zip line and rock wall. The park is geared for all levels. Starting with a Singletrack, you get Mammoth's 80 mile trail network that takes riders across the mountain from Twin Lakes to Red Lakes. The Downhill Track is high on very technical trails with big drop offs for experts riders. The X-Zones is the trail sections with specially designed free riding terrain and most popular. We're not the experts on the Mammoth Bike Park. For the best information on the Mammoth Mountain Bike Park visit World Bike Parks as they are an independent company specializing on the details of the best bike parks in the US including Mammoth. 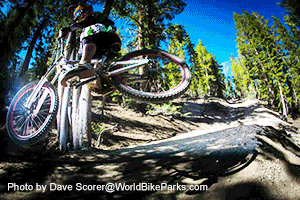 Voted in the top 10 of mountain bike parks, the Mammoth Mountain Bike Park made the list. The main lodge is the best starting point as you can get a lift uphill from the Main Lodge either by chair or by gondola. If you don't want to drive up to the main lodge, grab the free shuttle at The Village. It will have bike racks on it. Even though this is a mountain bike area there are plenty of hiking trails on the mountain that will give you great exercise. 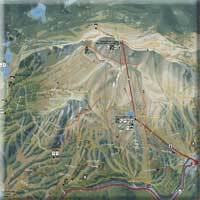 You can ride up to the top in the Panorama Gondola and use your feet to get down. Trails are marked with square signs and dashed while line. Good hiking shoes are a must. Sneakers are not recommended due to the loose gravel. Bring water, sunscreen and a hat as you are at altitude... as in closer to the sun. You will want to walk down the trails, not up unless you can handle the 11,053 FT elevation. Trust us on this one! 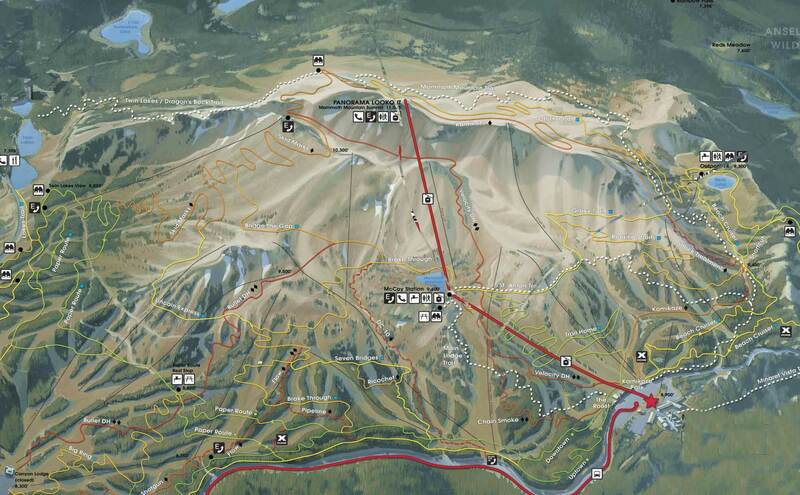 This is the official Mammoth Mountain Bike Park Trail Map	as provided by the resort. The scenic Mammoth Gondola goes from the Main Lodge to the 11,053 Summit. At the top the views of the entire Sierra region are picture perfect. The Gondola rises 2,124 feet in the air, and takes a little over 7 minutes to the top. This is the same gondola used in winter to service the entire Mammoth Mountain resort area. When we say the views are of the entire Eastern Sierra, we mean it. At the top of the gondola is the Sierra Interpretive Center which helps identify the different peaks and valleys of the Eastern Sierra region. 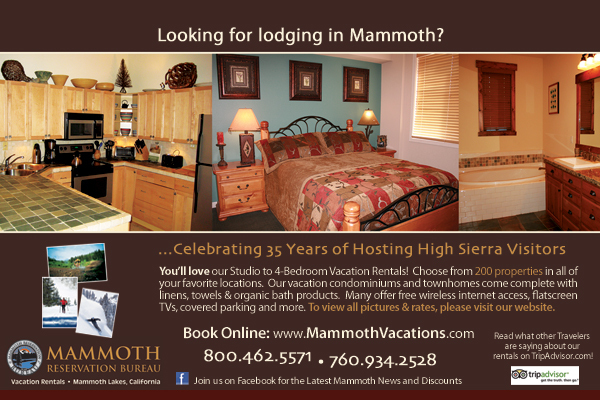 Mammoth is one of the highest, and our biggest neighbor is Mt. Whitney. There are fun facts and interesting information about the early settlers to this area, how the volcanoes formed the area, and how it became such a popular destination. There is also a small cafe up at the top for snacks. There is a fee to ride the gondola, but it is worth it. Be sure to bring your camera. Let us say that again... bring your camera. At the base of the gondola, you'll find that kids can ride a very fun zip line across the park. A zip line is a cable strung from tree top to tree top with a pulley attached. The kids are strapped in and ... zip across the line. It's a simple ride for very young kids. Maybe someday we'll have the bigger adult version. The climbing wall is outdoors, about 30 feet in the air, and kids of all ages can use it to learn the basics of rock climbing. With a safety guide and safety gear, the kids get a real thrill as they can scale up the rock wall. Two of the most popular attractions in Mammoth are the Devils Postpile and the hike to Rainbow Falls. Devils Postpile is a National Monument. Rainbow Falls is a long hike 1.5 miles each way through the forest. In order to make it to either trail head, you must take the shuttle from the Adventure Center.